If you are asked what the collective nouns for fish, puppies and birds are– you’d say school, litter and flock with ease, right? Probably equally so if you thought of lions, bees and locusts, which are pride, swarm and plague. But then you move far beyond the normal, the mundane and the examples you can easily recall. You move into collective nouns that are quite literally bizarre, funny and maybe even silly. Kagga Kamma has compiled the funniest, most unusual and interesting collective nouns from the mammals, birds and reptiles found at our Reserve. Now some might argue that “aardvark” is already an unusual name (and creature) but did you know the collective noun for them is an armoury? Yes, an armoury of aardvarks. And then you get the Chacma baboon that does not fall into one group but multiple – a troop, flange, tribe, rumpus or congress of baboons. Flange is however contested because it was invented by a comedy writer, Richard Curtis in a Not The Nine O’Clock News skit. Some primatologists swear by a flange of baboons. So we happily included it on our list. If you spotted a “group” of leopards you could say “look there are a leap (lepe) of leopards over there”. Porcupine – a prickle; striped polecat – a chine; and wildebeest – an implausibility! Black Backed Jackal: a pack or skulk of jackals. Burchell’s Zebra: a dazzle or herd of Zebra. Bush Karoo Rat: a colony, horde, pack, plague, swarm of rats. Cape Hare: a drove, down, flick, herd, husk, kindle, leash, trace, trip of hares. Four Striped Grass Mouse: a mischief, horde, nest or trip of mice. 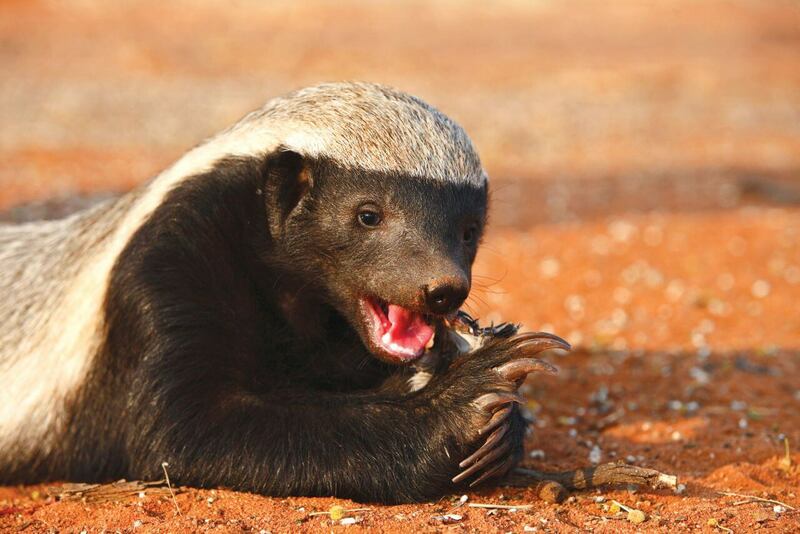 Honey Badger: a cete or colony of badgers. You probably know that a “flock” of crows are known as a murder? But did you know a “bunch” of eagles are – a convocation or aerie, a “flight” of Karoo Thrush – a mutation and a “cluster” of Jackal Buzzards – a wake. A wake is grimly suitable name when buzzards are often picking the last bits of flesh off a carcass or dead thing; and a wake in human terms is “a watch or vigil held beside the body of someone who has died, sometimes accompanied by ritual observances including eating and drinking”. African Harrier Hawk: a mew, aerie, cast, kettle, moulting, screw or stream of hawks. Barn Owl: a parliament or stare of owls. Crowned/ Blacksmith Lapwing: a deceit or desert of lapwings. Cape Turtle/Laughing Dove: a dole, dule, flight, piousness, pitying or prettying of doves. Karoo Lark/Clapper Lark: an exaltation, ascension, bevy and flight of larks. Common Starling: a murmuration, chattering, cloud, clutter or congregation of starlings. Hadeda Ibis: a colony of ibises. Now for the collective nouns from the more cold-blooded variety…Not everyone find reptiles delightful, interesting and hope for a chance encounter with the tetrapods but fortunately other people find them fascinating. Unfortunately the latter group didn’t give the reptiles their collective nouns; see for yourself below. A “handful” of snakes are known as a den, a bed, a knot, nest, pit or a trogle. Black Spitting Cobras or Cape Cobras are known as a quiver collectively – probably a side effect of seeing one; and Puff or Red Adder is a sum. Groups of Cape Sand/Western Sandveld/ Dwarf Plated Lizards… in fact any and all the lizards at Kagga Kamma are known as a lounge of lizards. Finally, the poor tortoises! Somewhere along the way the tortoise must have gotten a bad reputation because a “team” of tortoises is officially known as a creep. Now that you know your dazzle, from your aerie or mutation from your creep… what would you call a bunch of your friends and family on holiday? A good time? An exhaustion?